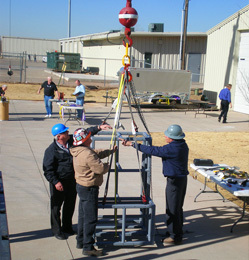 We offer custom Rigger Training and NCCCO Certifications. NCCCO Rigger I certification class: This is a 2 day program that consists of one day of intense classroom training followed by a day of practical exams and computer based testing. Rigger Introduction “in the field user class”: This is a 4 hour class that can be delivered in the classroom or in the field under real world conditions. Rigger Qualification I Class: This is an 8 hour course designed to assist employers in qualifying there riggers under OSHA’s 1926 sub-part CC standard. Rigger Qualification II Class: This is a 16 hour course that is more complex than the 8 hour program and is designed for more complex lifting requirements. Advanced Rigging Class: This is a 32 hour program designed to cover most aspects of mobile crane rigging. This course includes an active rigging shop tour to include a sling destruction demonstration.